Not too long ago now I published a blog all about how I balance blogging with a 12h a day job (link), and in that post I mentioned how I use an Excel file to track when I post, when I need to take photos, what PR contacts I have and also my finances. After this, quite a few people asked if I would be able to share more details about this file – so that I did – and more. 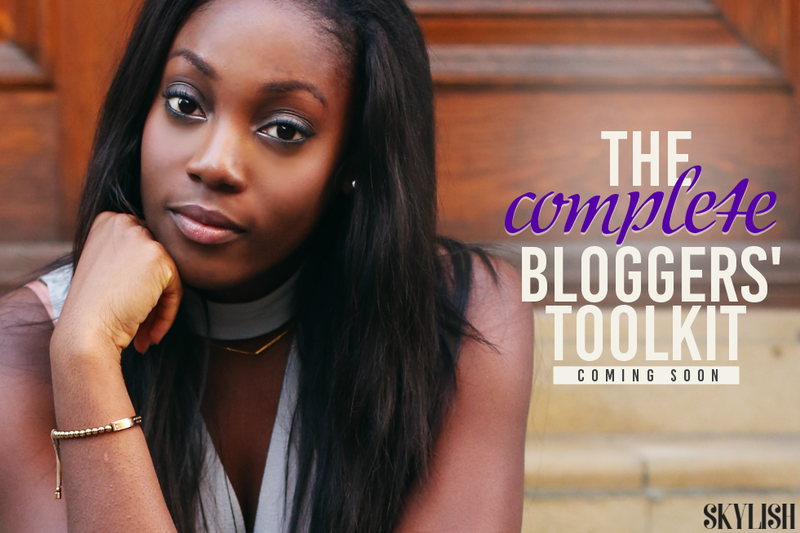 At some point in my life I’ve dabbled in writing, webdesigning, blogging and Investment Banking, so I’ve combined the skills I’ve learned from each of these roles to provide you with The COMPLETE Bloggers’ Toolkit! What do you get? Media Kit templates, in-depth blogging e-guides, and an automated Excel file that will allow you to schedule your posts, your shoots, track your finances, contacts, and more… Of course more information to follow shortly but to find out more details and register your interest early please follow this link here!! It’s launching in April 2017, but be sure to follow me on social media (or sign up to my newsletter), to be in the know about every toolkit-related. It’s often recommended that you blog about whatever is popular at the time to bring in loads of new visitors to your blog, and I can’t say I completely disagree with this. For example, around Valentine’s Day, I posted topic related to Valentine’s – because that’s what people would be googling. When everyone’s going back to school – of course I posted a back to scool guide, ‘back to school’ anything are always big search words around August and September time. And of course – you will be seeing my travels posts over the summer. But – these days I only post about trending topics if the topics themselves are something I can coinsider myself interested in. When I first started blogging – I’d post about everything that was popular. For example, hauls used to be very popular, so I would post a ton of hauls whenever I went shopping. And if there was a new make up product that everyone was blogging about – I would go and buy it ASAP to review on my blog. However – because I was posting about things I didn’t actually care about, it’d always be a bit of a chore to get anything decent written up and essentially it made for lots of crappy content. One day I evaluated my blog and asked myself the simple question – “would I read this?” I realised my dozens of haul posts and reviews about products I would never use were essentially just a waste of space. Although it’s good to be active in terms of SEO for your blog – authenticity is important, too… and it shows through your content! I’m a writer at heart – in fact, my first ever hobby was actually writing – I started folding up A4 papers and scribbling stories into them when I was five, and by the time I was fifteen I was writing 100+ page novels up into Microsoft Word. Taking this into account, over time I’ve developed my own style of writing. However, when I was just settling into the blogging world, I subconciously adjusted my style of writing to sound like whoever my favourite blogger was at the time. This is something I actually kept up for a very long time, and actually after a while, I think I became very aware of what I was doing. At the end of the day, nobody wants to read blogs that are just clones of eachother, and one thing that makes blogs stand out are their uniqueness and the ability for the writers to connect with their readers. So when I decided to revamp the stategy of my blog, I made it a thing to settle back into my own tone. Over a year ago now I decided to install a new series onto this blog called ‘Midweek Motivation’. After meeting my boyfriend, he opened me up to this brand new world of self-development and I’d never experienced anything like it before. I’d never really strived to be a better version of myself, and to develop myself, in fact most of what I strived for throughout life was just getting top grades – which is great of course, but that will only get you so far. Feeling extra inspired by this new found world – I decided to implement a ‘Midweek Motivation’ series where essentially it seemed I tried to become a self-developement coach every Wednesday, filled to the brimb with cheesy quotation pictures and at times, a lot of waffle. It was not too long ago actually that I decided to let the whole Midweek Motivation idea go as I completely lost any inspiration and found that I was just making up things to motivate people about. I got two sentences into a post about ‘riding out down periods’ and decided enough of the waffle was enough. I am not the female Tony Robbins, and I shouldn’t try to be, instead I changed Midweek Motivaiton into ‘advice’, and started writing posts that came from the heart, were based on things I’d experienced, and would be helpful to my target auidence! From career advice, to relationship advice, to university advice and then some – this is what I focus on now, and it’s a lot more authetic. When I started blogging, or even up until the last three quarters of a year or so of my blog, if I decided I wanted to put up content – I PUT UP THAT CONTENT. If I took photos of my outfit and they turned out to be a shambles – I didn’t care, I posted them and convinced myself ‘they weren’t that bad’ or that ‘the post will only be up for a few days before I cover it with something better’. There ws only one time I deleted a blog post because the photos were just that bad – but many times I’d hit publish knowing in my heart that I’d just uploaded garbage. My focus was more on just producing content (which is still important), and less on products good quality content. It’s great if you can churn out loads of posts, but unfortunately if all you’re churning out is a bunch of craps – it will not make a difference to your blog. It won’t give you more followers, it won’t get you more comments, if anything it’ll just make people close the screen (or never click on in the first place). Blogging is big now – there are hundreds upon hundreds of blogs out there – if you’re simply not producing good content, why do you think people will want to return to your blog? Scheduling is great, and lots of content is great but the quality of your content is actually one of the most important things in this industry. 7 Responses to "What I wish I knew before I started blogging | Plus: The COMPLETE Bloggers’ Toolkit"
Totally agree! Especially with style of writing. Mine was blog topics. I had so many topics that I wanted to write on but because it wasn’t popular or not in the accepted format I.e the why’s, how’s, tips etc, I didn’t bother. Now I’ve learnt to grow in my own lane. I write what I’m passionate about and in a way that convey the message. I’ve stopped comparing my blog to that of other people. Nice post! And sorry for the epistle. It’s definitely best to stick to what works for you. It’s hard not to compare your own blog to others – but comparison is most definitely the their of job..! Really great tips. I love how you have come into your own in this blogging world. It is so essential. I’ve also wrestled with finding my voice and being authentic with blogging so its great to read your words of advice.